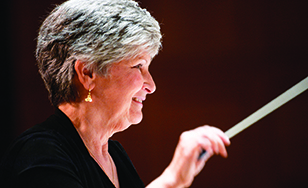 Marianne Connelly, longtime band director at St. Scholastica, is retiring this year, and will conduct her final concert at 7:30 p.m. Tuesday, April 26 in the College's Mitchell Auditorium. Though it will be a bittersweet evening, Connelly has selected energetic toe-tappers to set the tone for a fun concert. "Band Dances and Dance Bands" will feature St. Scholastica's Concert Band performing a beautiful Sarabande, energetic Russian folk dances, and hot Latin dances. The Jazz Band will perform beautiful ballads and fun swing dances. The concert is the culmination of a long relationship with St. Scholastica, which began for Connelly when she enrolled in the College and then graduated with a degree in music in 1977. In 1978 she began a two-decade teaching career at Marshall School, which was then called Duluth Cathedral. Connelly came to St. Scholastica in 1997 to build upon the College's concert and jazz band. It meant a lot to her to be able to teach at the college that had made such a difference in her own life. Connelly enjoys keeping in touch with her "band kids" as well as "band grandkids," influencing several generations of aspiring musicians. She's excited to invite all of her past students to the April 26 concert, even encouraging them to bring their own instruments and join the band onstage. Tickets are $5 for the general public, with complimentary tickets and special seating available for band alumni from (Duluth Cathedral) Marshall School and St. Scholastica. For more, visit spotlight.css.edu, St. Scholastica's one-stop shop for arts and lectures information and tickets. Call (218) 723-7000 for tickets.